So I ask Janine if she’d consider making something for my upcoming solo Stripped to be premiered at the Joyce in April. It’s the company’s 30th anniversary and though I’m laying my focus on music for these shows, Janine and I are in daily conversation all year. I can’t resist drawing her in. I tell her that Stripped is a call for paring down to the most basic choreographic process I use to build movement and I ask her if she can help strip me more. I stopped performing for a while when I hit 50. As my body began to transform to a thing of middle life, I was out of sorts and confused. I couldn’t execute the scope and range that I was accustomed to as my youthful dancer-ly self but its memory was still burned into me. It felt like “less than”, and being filled with “lack” left no space for a new dancer to emerge. After a period of absence from performing, I gradually began to let go of that former self and the desires for all the things about that self I banked on–the extreme line, the speed, the razor sharp shifts, the lash and punch extended far out into space–all the things that a new generation of Petronio dancers have mastered so succinctly. It suddenly seemed kind of fresh and engaging, that there might be something new to find in this new body. As I began rehearsing and looking for a movement language to practice alongside Philip’s score, I resisted the idea of choreographing move for note. I just couldn’t get interested and felt that I knew what that process would yield. My body and mind kept jumping around movement states related to the melancholy feel of the music and the characters emerging from that evocative musical context. I also began to collect some key childhood memory states from my recent memoir Confessions of a Motion Addict, as well as a series of 30 found hand gestures (one for each of the 30 years of the company’s existence) to inhabit in some way. 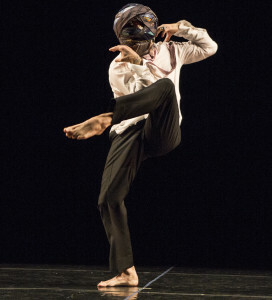 And as the rehearsals continued, I began to relinquish the idea of fixing or setting a solo and began to warm up to the idea of these elements, the gestures, states and shards of movement, as artistic ammunition to load into my choreographic gun to use in improvisational ways as I saw fit each night. To set any more seemed like a limitation that I needed to forego. Janine and I talked immediately about concealing the face- stripping identity to then find a distilled look at the DNA of the movement generating process that is in me. It was natural. And we were so attracted to an enlargement of my skull, some intuitive draw to the play between the bobble-headed and the brainy, the implied erasure through an invasive process beneath the wrapping. In the idea state, I was seeing it from the outside. I had no real or practical experience that the wrapping would be a serious kind of sensory deprivation until that first rehearsal when I was wrapped. I kept joking to Janine that I felt like Vincent Price in an adaptation of Poe’s The Pit and the Pendulum, the fear of being entombed, buried alive and the claustrophobic panic that I knew would rear its head (hahaha) in me. Her intervention severely limited breath, vision and sound (as I was trying to count Philip’s etude!) and attempting the execution of my physical score. These were all obstacles that challenged my ability to do what I think I do when I choreograph and dance. Yes, it seemed impossible at first. I was dealing with hurdles as they appeared while improvising through the blocks of materials I was working with, the shift in my balance with a newly configured head of new dimension and weight, my reliance on vision for orientation, the act of unwrapping while attempting to execute the movement tasks I set out and the fun of trying to slip under the taut lines of ties while dancing. As the rehearsals, and especially the Joyce performances proceeded, these interferences became exciting challenges that stripped me down to an elemental mover and thinker grappling with the tools I set out to dance with. They prevented me from slipping into the temptation of rebooting the dancerly things that I rely on, the ingrained habits of my dancing, the subconscious desire to sleekify my explorations. And they set me free in a way, in a very unexpected field of inspiration.